Barry Fox and Nadine Taylor are a husband-and-wife writing team living in Los Angeles, California. Barry Fox, PhD, is the author, coauthor, or ghostwriter of numerous books, including the New York Times number-one bestseller, The Arthritis Cure (St. Martin’s, 1997). He also wrote its sequel, Maximizing The Arthritis Cure (St. Martin’s, 1998), as well as The Side Effects Solution (to be published by Broadway Books in 2005), What Your Doctor May Not Tell You About Hypertension (Warner Books, 2003), What Your Doctor May Not Tell You About Migraines (Warner Books, 2001), Syndrome X (Simon & Schuster, 2000), The 20/30 Fat and Fiber Diet Plan (HarperCollins, 1999), and Cancer Talk (Broadway Books, 1999). His books and over 160 articles covering various aspects of health, business, biography, law, and other topics have been translated into 20 languages. Nadine Taylor, MS, RD, is the author of Natural Menopause Remedies (Signet, 2004), 25 Natural Ways To Relieve PMS (Contemporary Books, 2002) and Green Tea (Kensington Press, 1998), as well as co-author of Runaway Eating (to be published by Rodale in 2005), What Your Doctor May Not Tell You About Hypertension (Warner Books, 2003), and If You Think You Have An Eating Disorder (Dell, 1998). After a brief stint as head dietitian at the Eating Disorders Unit at Glendale Adventist Medical Center, Ms. Taylor lectured on women’s health issues to groups of health professionals throughout the country. She has also written numerous articles on health and nutrition for the popular press. Jinoos Yazdany, MD, MPH, is a board-certified internist and a Rheumatology Fellow at the University of California, San Francisco. She completed her undergraduate education at Stanford University, where she received the Deans’ Award for Academic Achievement and graduated with Honors and Distinction. She completed medical school at the University of California, Los Angeles, where she received a Humanism in Medicine award from the Health Care Foundation of New Jersey and graduated Alpha Omega Alpha. Dr. Yazdany also studied public health at Harvard University. Her research involves examining health disparities in the care of patients with chronic diseases. This is her first book. Part I: Getting a Grip on Types of Arthritis. 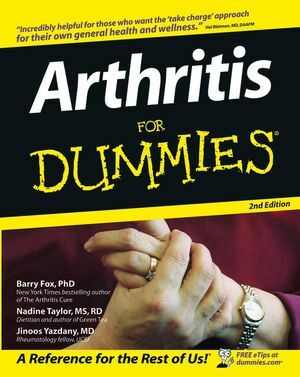 Chapter 1: What Is Arthritis? Chapter 2: Osteoarthritis: The Most Common Form. Chapter 3: A War Within: Rheumatoid Arthritis. Chapter 4: Investigating Other Forms of Arthritis. Chapter 5: Exploring Other Conditions Linked to Arthritis. Part II: Tests and Treatments: What to Expect from Your Doctor. Chapter 6: Your Doctor and You: Allies Against Arthritis. Chapter 7: Judging Joint Health with Low- and High-Tech Tests. Chapter 8: From Aspirin to Steroids: Medicines for Arthritis. Chapter 9: Cuts That Cure: Surgeries for Arthritis. Chapter 10: Overcoming the Ouch: Strategies for Pain Management. Part III: The Arthritis Lifestyle Strategy. Chapter 11: Fighting the Pain with Foods and Supplements. Chapter 12: Oiling Your Joints with Exercise. Chapter 13: The Right Stride and Other Ways to Protect Your Joints. Chapter 14: Controlling Your Stress, Aggression, and Depression. Chapter 15: Day-to-Day Living with Arthritis. Part IV: Is Alternative Medicine for You? Chapter 16: Exploring Alternative Medicine. Chapter 17: Discovering Herbs and Homeopathy. Chapter 18: Hands-On Healing Methods. Chapter 19: Other Alternative Approaches. Chapter 20: Ten Tips for Traveling with Arthritis. Chapter 21: Ten Ways to Save on Prescriptions. Chapter 22: Ten Professionals Who Can Help You Fight Arthritis. Chapter 23: Ten Crackerjack New Treatments. Appendix C: Weight Loss and Management Guide.